Are you interested in Japanese culture? 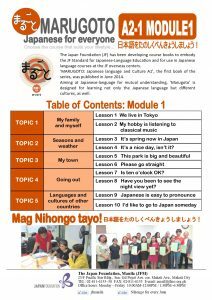 Do you know a little Nihongo and would like to improve your speaking skills? Then the MARUGOTO A2-1 course is for you! Understand sentences and frequently used expressions related to areas of most immediate relevance, e.g. very basic personal and family information, shopping, local geography, employment. 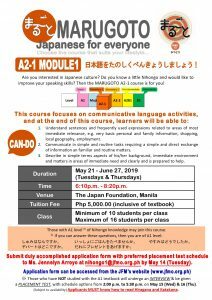 Those with A1 level* of Nihongo knowledge may join this course. – Shumi wa nan desu ka. – Depaato wa doko desu ka. – Issho ni gohan wo tabemasen ka. – Dare ni purezento wo agemasu ka. – Yasumi wa dou deshita ka. 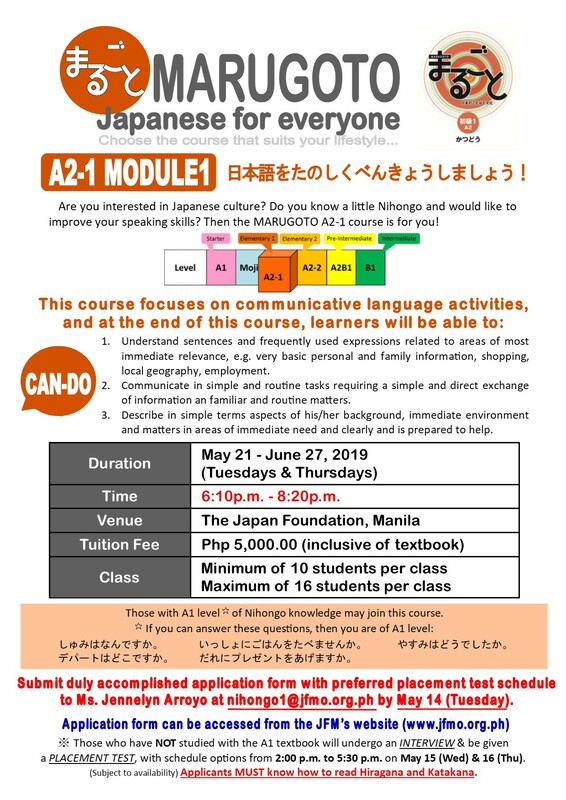 Submit duly accomplished application form with preferred placement test schedule to Ms. Jennelyn Arroyo at nihongo1@jfmo.org.ph by May 14, 2019 (Tue). Applicants MUST know how to read Hiragana and Katakana.